A new live DVD from Beyoncé is on the way. "4 Intimate Nights With Beyonce" at Roseland Ballroom marked the only time she would perform her new album, “4,” almost completely and to a very limited audience. The intimate setting allowed for only 3500 fans per night, and tickets sold out in a record 22 seconds. Backed by her all-female band, with an additional string section, the performances were punctuated with spirited stories detailing her journey before the album, “4,” including her years before, and with, Destiny's Child. A second package arrives a week later: on Tuesday, November 29, “Live At Roseland: The Elements Of 4” deluxe package is a two-disc DVD, with the complete concert, bonus offstage footage, a 20-page booklet and a video anthology that includes seven videos from her latest album. The concert documentary is filled with never-before seen footage that captures Beyoncé's life from eager five-year-old music fan to a consummate entertainer who is in control of every inch of her life and career. 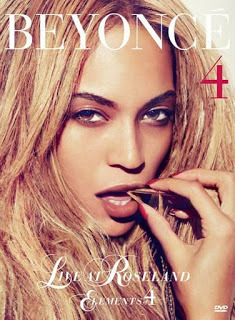 You can pre-order “Live At Roseland: The Elements Of 4” here.